The ALGIZ 10X, equipped with a proprietary power circuitry module, interfaces with multiprobe water quality sampling instruments. CHALLENGEReplace several display and data-collection devices with a single multi-use tablet that works with the power specifications of water quality sampling instruments.SOLUTIONUse the HydroTech NX10, a solution that adds custom software and a proprietary power circuitry module to the ALGIZ 10X ultra-rugged tablet.RESULTCollect and display water quality data while maximizing energy efficiency, all on a single lightweight device.In parts of the world where accessing clean water is as simple as turning on a faucet, water quality is easy to take for granted. But water quality monitoring is a complicated process that requires plenty of behind-the-scenes work and powerful technology, including water sampling probes and mobile data collectors. HydroTech ZS Consulting, a provider of advanced water quality monitoring solutions based in Texas, USA, uses Handheld’s Algiz 10X rugged tablet as the hardware base for its NX10 water quality monitoring device. The NX10 builds on the Algiz 10X with a proprietary power circuitry module and custom software that maximize the data collector’s performance with industry-specific water quality monitoring equipment, saving time and preserving power. HydroTech’s customers include many government environmental agencies and city employees. Owner Zak Sihalla reports that his clients have been able to replace multiple GPS units, multiprobe displays and field PCs with just one NX10. They can save all their work directly on the unit, with no paper forms to fill out by hand. They can also send data to the office before leaving the field, using the unit’s built-in Wi-Fi. “I’m really digging the rugged handheld — it’s a brilliant set up,” one client says. 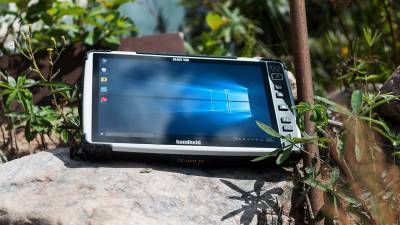 The Algiz 10X is a rugged tablet PC with a vivid 10.1-inch capacitive touchscreen plus simple touch navigation buttons and programmable hotkeys. It’s fully sealed against water, dust and dirt, and built to survive drops, vibrations and extreme temperatures. “The capacitive touchscreen has excellent visibility under the sun, and the keypad keys are responsive even with gloves on,” Sihalla says. HydroTech selected the Algiz 10X for its ruggedness, Windows operating system and expandability, plus its built-in RS232 port — a must for interfacing with water sampling multiprobes. And Handheld’s friendly and helpful service has made Sihalla a repeat customer. “They’re just good people to work with,” he says. The Algiz 10X has not only been pleasing customers across the world, but has even been seen in space! The Algiz 10X tablet features in the new motion picture LIFE, starring Jake Gyllenhaal, Rebecca Ferguson and Ryan Reynolds. How to Prevent Supply Chain Fraud What is 802.11ax WiFi and how does it compare to 802.11ac?